Indian bloggers are always in search for good income opportunities online and therefore we are sharing the best Snapdeal affiliate program review here so bloggers can also become aware about more platforms to make money fast online just by referring visitors from their websites to these shopping portals. Just like flipkart affiliate program the snapdeal affiliate commission rate is also very impressive and all bloggers can earn good income when their referred visitor buy anything from snapdeal within the time frame of 24 hours. The big thing which i like in the affiliate programs of these top shopping websites is they are so much popular among Indian buyers and there is no need to convince then to buy products, just join the program and start promoting their products with the offers given by them using the referral links given by them and see the magic and no doubt it is among from the top 10 online shopping sites also. Read some important details here before join it. 1 – Cookie period duration is 24 hours only it means you will earn income only when anyone purchase any product within 24 hours after clicking your referral link. 2 – Cancelled or returned orders will not give you any commission fee because if snapdeal is not earning any income then why it will pay you. 3 – All the orders at snapdeal would be approved to give you commission after 30 days of the transaction done. If anyone would talk about the commission structure of this program then i would say its really amazing and full of opportunities to earn more income by same efforts and you can see details about the commission rate below. A – Electronic products category – 10 % commission of the sale amount and maximum Rs.1250 per sale. B – For all other products – 20 % commission of the sale amount and maximum of Rs. 1250 on every sale. A – For electronic products – 2.5 % commission of total sale amount or maximum Rs. 2500 per sale. B – For all other category products – 10 % of total sale value or maximum of Rs. 400 per sale only. 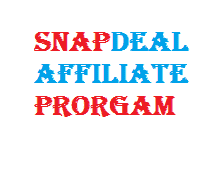 We hope the here shared snapdeal affiliate program review will be useful for you to get right information. There is one more shopping website for beauty and wellness related products buying with name Nykaa and you can read about Nykaa review here. It is a great article. Thank you for sharing the information about the snapdeal affiliate program. Thank you for letting me to know about Snapdeal affiliate program. I have just started a new coupons site, for that i am looking affiliate links and found your link about Snapdeal.